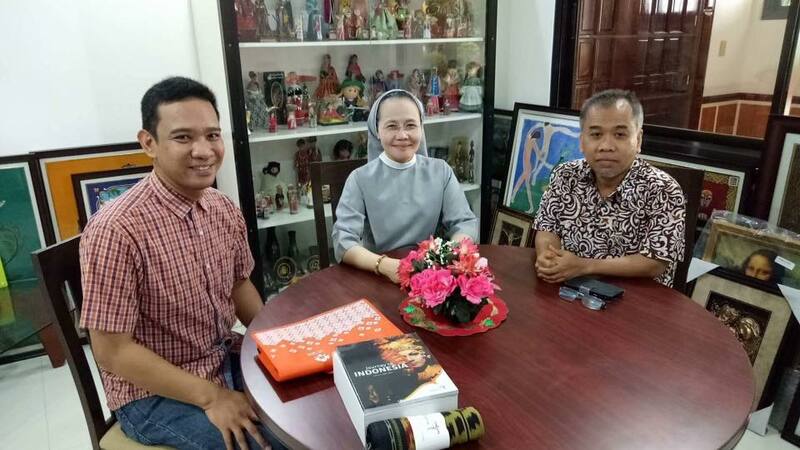 Mr. Hidayat Zakaria, Counsellor of Economic Affairs of the Indonesian Embassy Manila visited St. Paul University Philippines on December 1, 2017 upon the invitation of SPUP President Sister Merceditas O. Ang, SPC through the International Relations Director Dr. Jeremy Godofredo C. Morales. Upon arrival, the Indonesian Embassy Official, together with his staff, Ms. Maria Victoria Marcaida, SPUP AB Economics alumna, made a courtesy call with the President and discussed about current agreements between SPUP and various Indonesian universities, colleges and educational institutes. It was mentioned in the meeting that SPUP's curriculum is accredited in Indonesia as the university is among Philippine HEIs listed in the Indonesian Embassy. In the meeting with the 27 Indonesian students currently on campus who are enrolled in PhD in Nursing, MS in Nursing, MA in Nursing, BSIT and Indonesian Exchange students, the good Minister mentioned that as Indonesians, the students should report their presence in the Philippines to the Indonesian Embassy so that they will be properly accounted for while in Philippines. He also suggested that the students need to improve their English language skill as the Philippines is a country where people have good command of the English language and they can improve so much here in preparation for job opportunities to work abroad as a nurses especially in Australia, with high salary. Finally, he mentioned possibilities for Indonesians to explore other programs of study in the Philippines such as IT, Hotel and Restaurant Management and Culinary Arts. Finally, as an Economic Counsellor, he summoned the students to become entrepreneurs through their specialization and that they do good in their studies. He also congratulated the students for choosing St. Paul University Philippines because of its recognitions, awards and citations both nationally and internationally. The embassy official left some items for exhibit during the 3rd International Research Conference at SPUP.